Have David Beckham and Jessica Simpson been doing yoga together or something? If there's not some big celebrity tie-in, I suppose it could be mere coincidence that I've recently received no fewer than three yoga related CDs for review. So what is yoga? Though it's common to think of it as a stretching regime that's loosely associated with Hinduism, there's more to it than that. Like "kung fu," the term "yoga" can refer to philosophical and religious practices as well as the more common bodily activities. The Bhagavad Gita, for example, teaches of the yoga of devotion and the yoga of knowledge as well as the yoga of action. Yes, your yoga can be powerful even if you can't achieve the One-Legged King Pigeon pose. So what then is yoga music? Does it improve your mind? Your spirit? Your flexibility? Does it inspire lofty thoughts and the contemplation of the divine? I suppose that's up to the listener. First, EarthRise SoundSystem's Derek Beres and David “Duke Mushroom” Schommer of give us 12 tracks of gently grooving music on The Yoga Sessions. While these tunes are certainly more about mood than about message, they do have that relaxing yet energized spirit that opens the door for physical and mental rejuvenation. A sonic sister to The Yoga Sessions is the compilation InnerVersions from Six Degrees Records, as the songs were assembled by EarthRise SoundSystem co-founder Derek Beres. The 12 tracks on this album include some very well known world music artists, such as Azam Ali, Ceu, Karsh Kale, and Cheb i Sabbah. There's even a cut from Nusrat Fateh Ali Khan remixed by Gaudi. With such contributions -- from artists hailing from Pakistan, the USA, Iran, Brazil and beyond -- this is clearly a global-minded album. Call it dub-yoga. But don't look for devotional bhajans here. 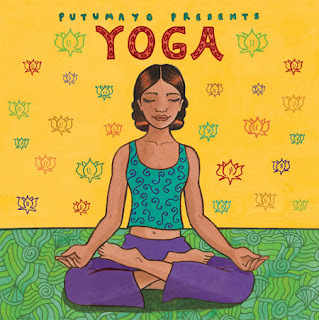 Finally, we have the 14-track collection from Putumayo World Music simply called Yoga. Like the Six Degrees album, this one includes artists you wouldn't necessarily associate with yoga -- such as Ablaya Cissoko with Volker Goetze and Susheela Raman with Ayub Ogada. The rest of the album's artists are drawn largely from the yoga/kirtan circuit, including Wah!, Krishna Das, Yogini, and Sean Johnson & the Wild Lotus Band. I wouldn't have expected it from Putumayo, but they've actually put together the most spiritually minded of these three releases. If you're looking beyond the feel of the music, this should be your first choice, though the other two albums have their own appeal. And the lack of overlapping artists among these CDs means you can get all three without adding duplicate music to your collections. Perhaps one for knowledge, one for action, one for devotion?